Here we have, everybody's favorite old man in Hollywood, actor Billy Bob Thornton. 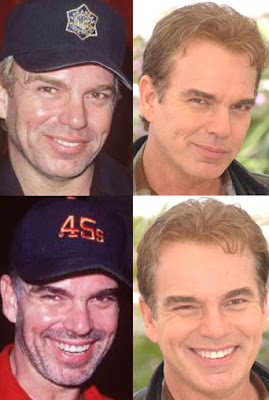 Billy Bob has looked twice his age, ever since he broke onto the scene and now suddenly at age 54, he looks better than ever. Could this be a result of plastic surgery? Well, aside from the obvious hair plugs, i would guess he has underwent a minor facelift, most noticeable around his eyes, which seem a bit tightly stretched. Perhaps he got some advice from his former wife, Angelina Jolie, who knows a thing or two about plastic surgery. For a change, here's one who looks great.